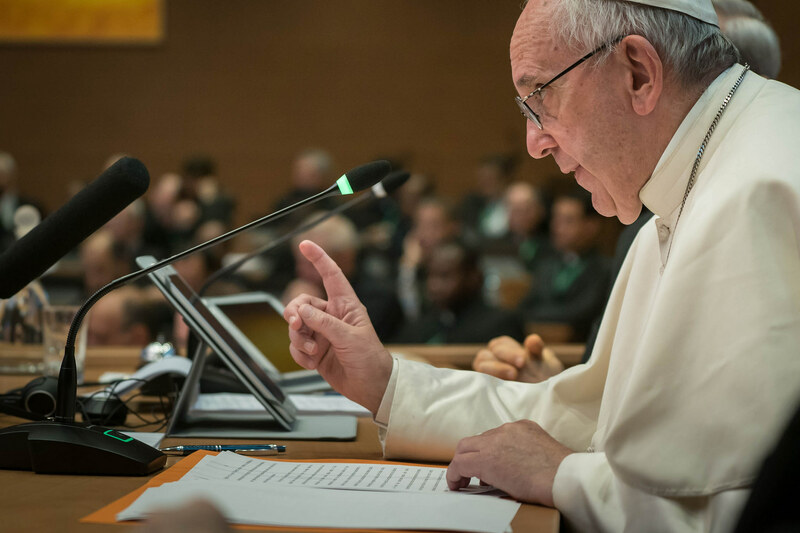 A historic event: this was the encounter of General Congregation of the Jesuits with Pope Francis. The first to be aware of this event was precisely Father General Arturo Sosa who asked the Jesuits to prepare themselves spiritually for this encounter. It’s never happened that there was a Jesuit Pontiff and therefore that a Jesuit Pope intervenes at a General Congregation of the Jesuits. His discourse then assumes for the Society a truly strong, special value. But, even before his discourse, just the Pope’s presence had an extremely meaningful value, also for its unusual modality: an audience in the Hall of the Congregation itself which lasted for hours of free and spontaneous encounter in an open and relaxed climate, as perhaps had not happened for a long time. The Society is taking greater awareness that the petrine ministry is today carried out by a person formed in its womb and its spirituality, that of discernment. Many characteristics of the current pontificate, moreover, are understandable in their roots only by considering the spirituality in which the Pontiff grew in his human and spiritual experience. Therefore, Francis represents a positive challenge for the Society, and a specific incentive of prayer, reflection and assumption of responsibility. Consolation. We live in a wounded world and the Jesuit is also a wounded man. The world is often moved by fear and reacts lending an ear to the desolations and fears. For Francis only if we experience the restoring strength of consolation in the heart of our wounds—both as people and as the Society—can we wake up from our torpor, walking and helping others. Then we must ask for consolation—the Pope says—«insistently». The usual state of the Jesuit must be consolation. This is the experience Francis invites us to make, then: to let ourselves be consoled by God and to live our ministry as a minister of consolation bringing into the world reconciliation, justice, mercy. And in this Francis himself was a model speaking in his higher magisterial texts of Evangelii gaudium, Laudato Si’ and Amoris Laetitia, words and expressions that are synonyms of consolation for him. And he adds: for the Pope «the nearest human attitude to God’s grace is humor». Compassion. The Pope asks us to let ourselves be moved by the crucified Lord and standing at the foot of the cross to feel ourselves loved by him. This is the experience that leads us to be sensitive to the pain of humanity, to experience compassion. «Where there is pain, there the Society is» said Father Arrupe. Only if we experience the healing strength of the compassion of Jesus crucified can we be healed and heal others. This pushes us to commitment for justice and to be with the poor and for their part. At the end of this discourse, Francis turns to Mary with the appellation of «Our Lady of the Way». The Society is not only a group of men with the same ideals, but a group of friends who are on the way, in journey with Jesus, a step at a time.